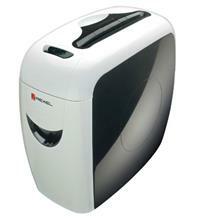 The Rexel Prostyle is a stylish cross-cut shredder capable of shredding up to 11 sheets of 80gsm paper at a time. The P-4 security rating makes it suitable for the shredding of highly confidential material and it can be used at home or in a small business environment. The Prostyle shreds paper into approximately 400 4x35mm pieces. The large 20-litre pull out bin can hold up to 200 sheets and a handy clear window allows you to see when it needs emptying. Other features include an induction motor for quieter shredding, plus auto-start and stop, and a reverse option to help clear any paper jams. The Prostyle handles both paper clips and staples (so you can save time by not having to remove these prior to shredding) and it can also shred your old credit cards too. The shredder also comes with a two year warranty.